West of the Sierra Nevada Mountain range and northeast of Sacramento is the beautiful city of Lincoln, California. It’s home to the Creative Beasties Workshop and printing abode of Danny Rhoades. 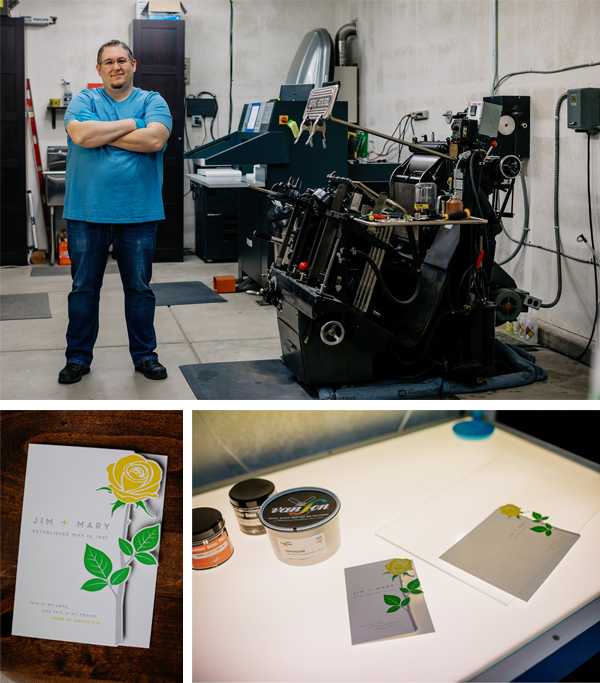 The garage-turned-printing haven features the thrum of a Heidelberg Windmill on which Danny creates his latest colorful creations. Danny throws open the doors to give us a tour of his studio. EVERCHANGING WORKSPACE The workshop is in the tandem portion of our garage. I had a bunch of fluorescent tube lights installed to give better lighting. Other than that it’s pretty sparse. We tried to finish it with some texture and paint but we didn’t know what we were doing and made a mess. Then we decided just to leave it half done because we ran out of time and had to stop for equipment delivery. THE HEART OF THE SHOP My favorite thing in the shop is my Heidelberg Windmill. It’s the heart of our workshop and is what makes all of our letterpress projects happen. CALIFORNIA NEIGHBORHOOD Our house backs up to a highway, so our backyard view is a 20 foot sound wall. We’re in a recently developed suburban family neighborhood. TYPE OF SHOP I’d actually really like to open my shop up to community printers and let them use my equipment to allow budding printers get started. However, I don’t know how to make that happen yet since I’m worried about the legality of it and if it creates any liabilities or risk which I’m sure it does. THE PRESSES We rely on our Heidelberg Windmill 10×15 press from the late 70s to print all out letterpress projects. We also have some digital printers, a hobby laser cutter, vinyl cutter, and a heat press. MOST VALUABLE SHOP TOOL There’s so many things I rely on heavily, but if I had to pick one, I’d go with my oil can. It really makes maintenance a breeze. FAVORITE INK Van Son Rubber base inks are what we use. Current favorite ink color is probably Orange. I used it in a split fountain test run along with Purple and it really took me by surprise how nice of a color it is. SOLVENT OF CHOICE We took Boxcar’s advice and use California wash. It seems to do the best job overall. We’ve also use odorless mineral spirits from time to time along with a roller wash we got from a local distributor, but usually come back to California wash again due to its reliability. PLATE AND BASE OF CHOICE We use a Boxcar Base system, of course, along with KF95 and KF152 plates depending on the job. We’ve been using this system since inception in 2014. OIL OF CHOICE We use Mobile DTE Oil Heavy. WHAT TYPE OF RAG DO YOU CLEAN UP WITH We use Scott shop towels and white cotton rags that we cut from t-shirts. PIED TYPE No type, we do everything on photopolymer. ORGANIZATION ADVICE I keep all my packing materials in a drawer pre-sorted by weight for easy setup. I do the same with pretty much all my materials, but that’s the best example. PRINTING ADVICE Spend the time to line up your plates on the Base. If you’re careful, you can save a ton of time on press. 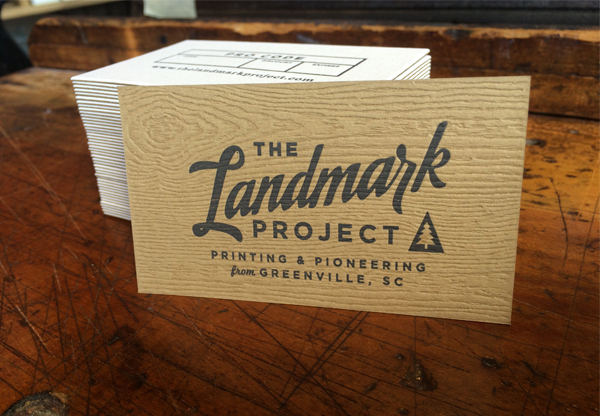 In the beautiful rolling landscape of Greenville, South Carolina you’ll find the versatile Dapper Ink letterpress and silkscreen print shop. 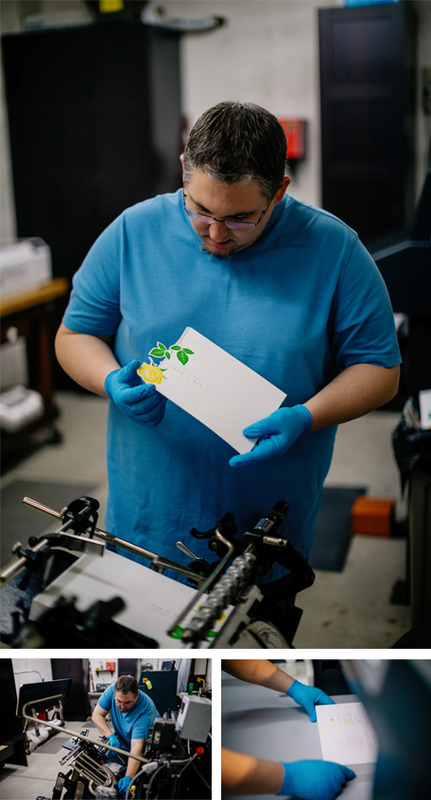 The down-south shop boasts expertly printed pieces, a great design staff, and a penchant for perfecting the right amount of ink (whether it’s on a tee shirt or cotton rag paper stock). 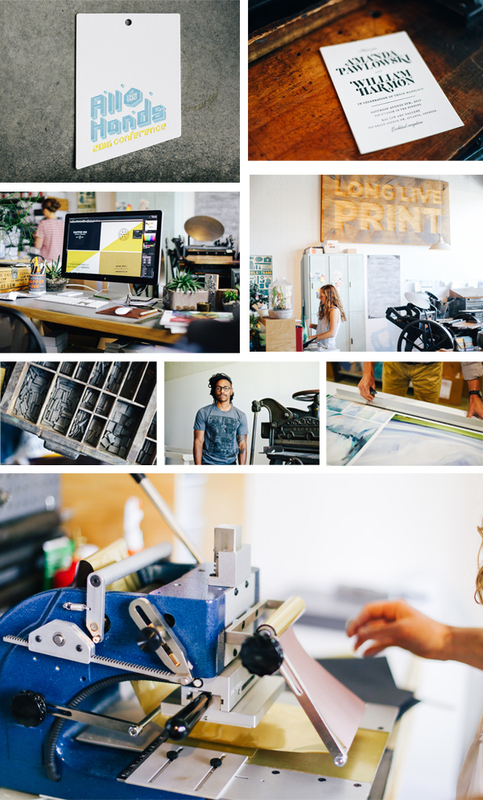 The bright & light-hearted Virginia gave us a tour of her studio to talk shop, expanding to a new location, where to grab a great bite to eat, and of course… letterpress. PRINTING BEGINNINGS We are a custom print and design shop, primarily focused on screen printed apparel. Matt Moreau and his wife Jen started screen printing t-shirts out of their house in 2007, and now employ a full team of printers and designers. Our first letterpress machine, a Chandler and Price, came from a local printshop that had closed its doors. Matt started building a letterpress client base, and would print whenever he had some time to spare. I started learning on the C&P when I interned for Dapper during college. They brought me on as the full time letterpress printer about a year and a half ago. TYPE OF SHOP We are a full service print and design shop. We have two automatic screen presses, three manual screen presses, a wide format printer for fine art prints, a Chandler & Price, 2 table top clamshell letterpresses, and a hot foil machine. We also facilitate digital, offset, and anything else our customers can think up. NUMBER OF PRINTERS IN THE SPACE We currently have two full time designers and two design interns, and Matt, the owner, now focuses on designing for our sister company The Landmark Project. We have between 15-20 full time and part time employees between the two companies. The designers here do everything from helping people refine their t-shirt or business card designs to full branding for new companies as well as creating designs for our own Dapper Ink retail line. SIZE OF PRINT SHOP Our main shop is about 1500 square feet. We also have a secondary space that is about 6000 square feet and we originally planned to move the business there, but it filled up too quickly so now we have both spaces. The large space is in a new development called Hampton Station. It’s a warehouse facility that is being converted into shops and green space. There is currently a crossfit gym, a paddle board company, and a brewery operating in the other spaces. THE LOCATION We are in the Stone’s Point shopping center that includes a dry cleaner, custom denim shop called Billiam, a home goods/gift shop called Urban Digs, and a craft beer and wine bar Community Tap. We have a rotation of five or six food trucks that setup for lunch and dinner outside of Community Tap. MOST VALUABLE SHOP TOOL We went through a mile of double sided tape in the span of about a year. I use it for press setup, and we seem always need it for something. PLATE AND BASE OF CHOICE We have a standard 6×9 Boxcar Base that we’ve used from the beginning, but I’m thinking it’s time to upgrade to the 9×12. SOLVENT OF CHOICE I just started using Easy Street for cleanup this year, and it’s a real game changer. ORGANIZATION TIPS I wish we had some organization secrets [laughs]. PRINTING ADVICE Mixing reflex blue into black gives much better coverage than straight black ink. COMING SOON In 2017 we will be focusing on our new retail/wholesale line. We are currently in 8 shops around the country, and hope to expand. I am also excited to be training Alexander, one of our screen printers, on the C&P. We are hoping to add another press, and develop our poster printing capabilities.